Airplane picture looking to the east from the tip of the Okaloosa Island to the Destin Harbor. the water but not the Gulf. 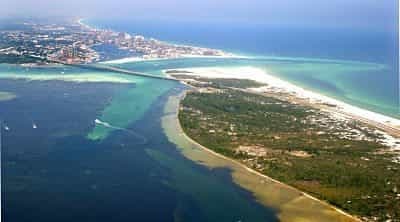 The Destin Harbor stretches about 4 miles from near the Destin Bridge running east parallel to the beach. Most of the condos on the Destin Harbor have marinas and boat docks. Surprisingly enough I think the view from the Destin Harbor condos are some of the best we have to offer in Destin. You get the best of both worlds from many of the taller condos receiving views of the Destin Harbor, Gulf and Destin Pass. There are also many condos in Destin that are on the Bay. These condos offer a much different feel and also have spectacular views. For the boaters the condos along the Destin Harbor and Choctahatchee Bay are second to none. Below is a list of the condos on the Destin Harbor and along the bay. Simply click on a condo that you are interested in and get more detailed information about that Destin condo and search for condos for sale. Feel free to call Danny Margagliano with any questions at 850-830-4747. Condos that are located in the Destin Harbor, along the bayfront and in the Destin canals are perfect for boaters. The condos in these areas are sheltered and protected from the wind and waves. If you cannot find a condo that comes with a dock for your boat there are typically boat slips for sale. Condos along in the bay and Destin Harbor range widely in price. It is possible to find a small studio or even one bedroom condo in the 100s. High-end luxury buildings have units for sale in the millions of dollars. Is it possible to a condo with a boat slip and beach access? The answer to this question is absolutely. Many of the condos that are located just off the Destin Harbor in the canals have private boat slips, docks and deeded beach access. Many of these condos have panoramic views of the Gulf of Mexico, Destin Harbor and the Destin Pass. These views cannot be captured properly in a picture taken of you be appreciated in person. This type of real estate is very sought after and will typically be sold at a premium price. Almost every condo in the Destin area allows for owner pets. Each building will have its own restrictions on how many pets are allowed in size restrictions of dogs.